Commercial blenders aren’t like everyday blenders. In fact, they couldn’t be more different. It would be a mistake to think that you understand industrial blending machines just because you’ve used a kitchen blender to make smoothies. Here are a few tips for understanding the different types of commercial blending machines and what they can do for you. What do you need to blend? Some machines aren’t meant for things like volatile chemical mixtures. Others might not be able to keep up with your daily volume requirements, or they might require too much power for your mid-sized factory to handle. It doesn’t mean that the blender is <i>bad</i>. It just means that it isn’t the right one for you, and you’ll need to keep searching. If you live nearby, ask the manufacturer if they have blenders displayed in a showroom. If they company is too far away for such a trip to be feasible, ask if they have pictures of the product from multiple angles and in different kinds of light. You can also look for reviews with user-submitted pictures that have nothing to hide. 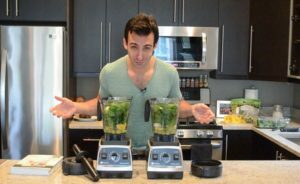 Ideally, you’ll be familiar with every inch of the blender before you hit the “order” button and set your decision in stone. What happens if your industrial blender gets damaged during transport? What if it stops working after two weeks? What if it requires multiple replacement parts? If you’re covered by a warranty, these things will only be a minor inconvenience. If you don’t have any kind of product insurance, however, you might be left holding a ruinous bill and wondering how it happened. Always agree to the warranty.